REPORT: Sevenoaks had won all their qualifying group fixtures and were expected to be the toughest opponents that the Norwich City under 14s would face in there regional finals. Despite the fact that Norwich only needed a draw to qualify for the national finals and Sevenoaks required a win it was Norwich who started the fastest creating a couple of early chances before taking the lead through a short corner. Toby Pallister beat a couple of players at the top of the D before clipping a backhand shot past the keeper for Henry Baker to tap in. Although Sevenoaks did pose a threat down the flanks Archie Ward, Krishan Patel, Cameron Hansell and Farren Miller prevented them from creating an real chances. Norwich through Max Wilson, Ollie Millett and Jack Whitlam continued to threaten. Norwich extended their lead through a well struck Sam Hyatt short corner. Sevenaoks now chasing the game pulled one back with a couple of minutes to go and might have equalized if Will Farrow in the City goal had not pulled off an incredible stick save. The City boys are now looking forward to playing the other top sides in the country at Reading Hockey Club on the 11th May. REPORT: In there second pool game against a Bromley and Beckenham the Norwich City under 14s took. The Norwich forwards of Max Marcus O'Sullivan, Jack Whitlam, Duncan Mallett and Ollie Millett pressed the Bromley defense hard all game. Their work and this pressure lead to Max Wilson intercepting a Bromley and Beckham 16 before driving into the D and calmly slipping the ball past the on-rushing keeper. City continued to dominate the game through the midfield work of Tom Ellis, Freddie Smith, James Cross and Henry Baker. They stretched their lead when Toby Pallister defected a James Cross shot/cross into the goal and could have sealed the match if the combination of keeper and post had not come to Bromley and Beckham's rescue following shots from James Cross, Marcus O'Sullivan and Toby Pallister. Bromley and Beckham scored through a short with under 5 minutes to go and then won a short corner with the final attack of the game. They moved the short corner right and fired at the goal. Sam Hyatt blocked the shot defecting the ball over the top of the goal. A draw v Sevenoaks would be enough to gain qualification to the National Finals. REPORT: Norwich started strongly against Ipswich and East Suffolk with Max Wilson and Freddie Smith causing havoc down the right hand side. They controlled the match through the passing ability of Sam Hyatt and James Cross but could not convert their early chances. Ipswich showed some threat on the break but it was tough for them as they had so little of the ball. Norwich took the lead just before halftime with a well struck Sam Hyatt shot from a short corner. Norwich continued to dominate after half time and extended the lead shortly after half time when Toby Pallister tapped in a James Cross strike. Ollie Miller added the third having taken up a great position at the far post and Henry Baker concluded the scoring with a powerful backhand shot. A good confidence building win. City’s u18 side fought valiantly in an exciting quarter-final match but ultimately came up short against a Beeston HC side which included several junior internationals. City’s u18 Boys team travelled to the Nottingham Hockey Centre for their Quarter-Final match in the England Hockey u18 Tier 1 Competition. Despite being the underdogs, City felt confident, started well and, in the first 10 minutes, had the better chances with Ben Chapman finding himself one on one with the keeper, but being thwarted with a good save. However, Beeston were technically very strong, picking up any loose passes and gradually cranking up the pressure on City’s defensive unit. A couple of City mistakes were pounced on and punished, giving Beeston a 2-0 lead which was not in any way reflective of the balance of play. City fought back, winning a short corner; Cameron Cooke’s shot was parried by the keeper but the ball only reached Ross Butler, who dispatched it with venom into the goal. The next goal was likely to determine the shape of the match, but City were dealt a blow when skipper Harry Paterson was harshly yellow carded after slipping on the water pitch as he closed in for a tackle. Beeston made their extra man count with a good move resulting in the ball being brutally smashed from a tight angle into the roof of the net, giving keeper Ben Nkrumah no chance. At 3-1 down going into half time, the coaches encouraged City to fight their way back. Whilst the boys did their best, they could not withstand the relentless Beeston pressure who got themselves 5-1 ahead with 20 minutes still to go. Many teams would have folded at this point, but the last quarter of the match was City’s finest, with the Norwich Boys having several chances to make the score more respectable and somehow being denied by the post or the keeper on every occasion. Meanwhile at the other end, Ben Nkrumah kept Beeston’s tally down, amazingly saving two penalty flicks in two minutes, much to the astonishment of all watching. So, the game ended at 5-1, which felt a little unjust to a City team who had given Beeston a good run for their money. However, the boys should feel proud of their performance both in this match and in the Cup as a whole. Thanks are due to all the parents who have ferried the boys all over the country, and to Paul Roy for helping out on the sidelines. Special thanks is also due to the three u16s (Rio Iaccario, Joseph Roy and Jonty Black) who stepped up to cover absences and who were really impressive. Man of the match was a tough call, with votes awarded to flick hero Ben Nkrumah and the ever-strong duo of Daniel Phillips and Cameron Cooke in midfield, but the award this week goes to Harry Paterson who was combative throughout, gave the Beeston midfield a good run for their money and picked out some excellent passes to open up the attack. City’s u18 Boys travelled to a Bishop’s Stortford on Sunday for their EH Tier 1 match, with the winners being awarded a Quarter Final slot against Beeston HC. City felt confident but knew that, without any subs, it was going to be a tough ask to compete for the full match against a good team. City came out strongly, troubling Stortford from the off with the speed of their attack. However, it was the opposition who scored first with a well taken short corner. City fought back, causing the Stortford keeper to make some last ditch saves. The pressure had to tell and after some good work from Gautham Narayanan to win a short corner, Ross Butler put the ball away with a smart dragflick. The game was now end to end, with Stortford struggling to contain the speed on the break of Butler and Ben Withers up front. It wasn’t long before Dan Phillips scored the next, picking the ball up just past the halfway line and driibbling past several defenders before slotting the ball calmly inside the right hand post. With City 2-1 up at half time, coaches Al Paterson and Tom Cooke encouraged the boys to slow the game down, retain possession and conserve energy. This was needed, as Stortford came out with a revised game plan, working the flanks and keeping the pressure on City. However, City’s central defenders George Harrad and Tom Bailey were imperious, ably aided by Alex Merron and Harry Bassett and, for all of Stortford’s pressure, goalie Ben Nkrumah was not called upon to make too many saves. Meanwhile, City’s strong midfield of Phillips, Harry Paterson and Cameron Cooke made life extremely difficult for Stortford, hassling and harrying and pushing them backwards. With City’s speed on the break causing Stortford problems, it was City who took a commanding 3-1 lead, with Paterson slotting a short corner past the keeper. City soaked up the pressure for most of the rest of the game and, whilst Stortford were to score again to make the final few minutes very tense, City played intelligently and deservedly came through as victors. This was a brave, skilful and hard fought match against a good team and every one of City’s players put everything into it, with no rests. Man of the Match was awarded to Dan Phillips for a magnificent goal and a superb stint in midfield. City now travel away to Beeston HC next Sunday, with a place in the semi-finals to play for. REPORT: Norwich City's under 14 cup team produced another dominant display to virtually guarantee winning their cup group. Norwich started well moving the ball around the pitch with great pace. They took the lead through a reverse stick shot from Marcus O'Sullivan; the lead was stretched first through a James Cross drag flick and then a solo dribble and reverse stick shot from Toby Pallister. Norwich could have extended their lead when Henry Baker's was fouled in front of goal following a driving run. The resulting penalty flick rebounded off the cross bar. Minutes later Henry smashed a powerful openside shot into the corner of the goal only for it to be ruled out by the umpires. The second half did not provide any let up for Saffron. Any attacks were snuffed out by Archie Ward, Farren Miller and Sam Hancock. Sam Hyatt and Krishna Patel passing ability exposed weakness in the Saffron Defence; Max Wilson and Ollie Millett's pace kept causing constant problems for them; The dynamic Freddie Smith never allowing Saffron midfield to settle; second half goals came for both Duncan Mallett (2) and Jack Whitlam. All in all a quiet game for Seb Kimber in goal! This is proving to be a tough season for our relatively young U16 boys. To the 11 players that were available I thank them (and the fantastic parental support) for fighting to the bitter end and never giving up. In terms of the game we started slowly and allowed the home team to dominate possession and territory. Whilst the opening goal was a result of some poor marking and half-hearted tackle attempts it was pleasing to see our young guns show steely resolve and improve as the game progressed. When we we kept possession through neat triangles in and out of centre midfield to both flanks we looked good but sadly we always looked vulnerable when Saffron attacked at pace and fluency. This should take nothing away from our defence who yet again put in a major effort but more to do with the high quality linking play of the opposition. 5-0 at half time was tough. Saffron were hospital hosts with a very good set of players who continued to play the game properly despite their comfortable winning margin. Robert McCall was nom8nated as our man of the match. Another good victory for the City under 14s; this time against Harleston Magpies. City took an early lead when Jack Whitlam took a reverse stick shot from close to the base line which ended up in the roof of the net. City stretched the lead when (man of the match and captain for the day) Freddie Smith put away a rebound from a short corner. The third goal created by Ollie Millett’s delightful pass was calmly finished by Max Wilson. Toby Pallister completed the first half scoring with a solo effort which saw him carry the ball from the half way line leaving the Magpies defenders in his wake before lifting the rebound following the Magpies’ keeper’s initial save. City’s dominance in the first half was build on the outstanding performances from Sam Hyatt, James Cross, Krishna Patel and Cameron Hansell. The patience and good decision making of the “defensive” unit created the space and gave the forwards the opportunities to score. The second half was tighter. Magpies came out hard and converted an early chance. City’s control of the match was quickly re-established with Jamie Granville, Sam Hancock, and Mattie Roy harrying the Magpies from the front to the back. Then the tireless Henry Baker picked out Ollie Millett for the fifth goal and Jack Whitlam reverse stick completed the scoring. Despite the good team victory they boys felt they could play better! 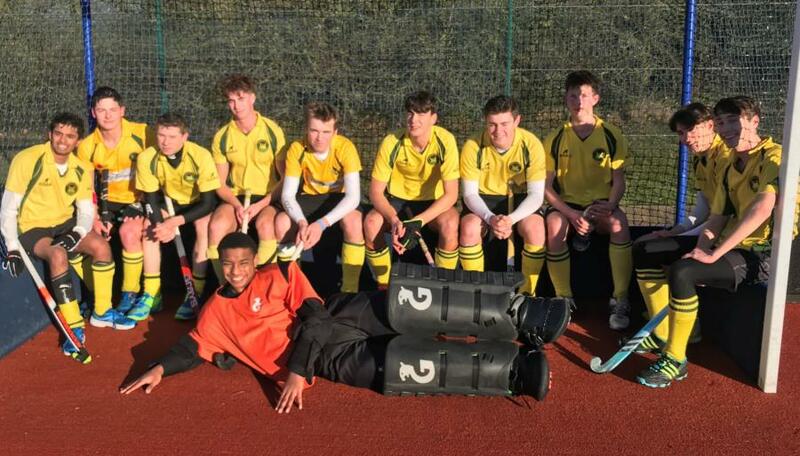 Norwich City u18 Boys played brilliantly in beating Cambridge u18s 3-2 in an entertaining and high quality game in the England Hockey Competition yesterday. City’s u18 Boys travelled to Cambridge on Sunday primed for a really competitive match against premier opposition. The game started at breakneck speed, with City quickly taking the ascendancy as the midfield of Dan Phillips, Harry Paterson and Cameron Cooke began to dominate. Cambridge were quickly penned into their own half but remained a danger through smashing long balls forward for their speedy forwards to run onto. It was City who carved out the initial chances with forwards Ben Withers, Ben Chapman and Ross Butler in irrepressible form. Withers came close with a thunderous shot, before Butler’s lob beat the keeper but unfortunately also the bar. Despite some great efforts from the Cambridge keeper, a City goal was coming and it was to be Cameron Cooke who made the most of a bobbling ball in the D and smashed it home. Butler then made it two when he patiently waited for the ball to come under control before slotting it home. It was not all one way traffic and defenders Harry Bassett, Alex Merron, Tom Bailey and George Harrad had to be very alert to snuff out the Cambridge breaks. 2-0 up at half-time, City were very much in the driving seat. Coaches Al Paterson and Tom Cooke urged the boys to keep up the work rate, to move the ball earlier and to keep up the marking in defence. With new boys Willem Wibaut and Gautham Narayanan providing much needed fresh legs, City continued to press hard and created several changes before scoring a third. This time, Cameron Cooke smashed a ball from the right into the D. Harry Paterson deflected the ball with great skill but was denied by the post and Butler was first to react to net the rebound. At this point City should have been home and dried. All credit to Cambridge who kept going, with keeper Ben Nkrumah having to make several smart saves. At 3-0 up with 10 minutes to go, City were surely in the clear, when Cambridge managed to score twice in quick succession through rapid breaks to set up a nervy ending. City managed to hold out for a 3-2 win, which keeps City in the Tier 1 competition alongside many of the top clubs in the country. Many of the team have played together since Minis and it is impressive and rewarding to see how far they have come. There were numerous candidates for Man of the Match, but it goes to George Harrad who was always alert in defence, made some excellent tackles, took the ball out of the air imperiously and had an excellent workrate. We wait with baited breath to see who we will be up against in the next round. REPORT:Everyone arrived on time and raring to go at the Ipswich school ground to play in the first round of the competition against IES. The pitch is a fantastic facility and it was a warm and bright morning....perfect conditions! The Norwich City team was constructed with strong players including newcomers Duncan Mallett James Cross and Max Wilson and the match began with heads high and a positive attitude. Within minutes Jack Whitlam had received the ball and manoeuvered it cautiously round the keeper and into the back of the net. Some excellent passing back and around the edges secured a further two goals from Ollei millet and James Cross before the half-time whistle. Into the second-half IES never really posed a threat, the defence was strong with some fine interventions from Archie Ward, Sam Hyatt and Krishna Patel. We missed some opportunities to further increase our lead but the midfielders worked hard to keep getting the ball up the field and present more chances. The subsequent two goals scored by Duncan and Freddie were secured after some superb passing and control of the ball down the length and breadth of the pitch and some good cohesive teamwork. Jack completed the game with a sixth goal with a reverse stick scooping the ball up high and straight into the back of the net - this time it paid off! Huge credit should be given to Sam Hancock, Max, Matty, Joe and Toby who worked tirelessly to get the ball up the pitch and of course Seb who managed to stave off a few challenges to keep a clean sheet. The final score 6-0 ... a credible score from a very able team which showed potential to go far in this competition. Come on Norwich City under 14! This was a real backs to the wall effort against a very strong Magpies side that created a lot of chances. City fell behind inside the first two minutes when defensive indecision allowed Emms to rifle the ball home. City were lucky not to fall further behind as they struggled to deal with the visitor’s pace on and off the ball but gradually they found their feet to create a few chances of their own. As is so often the case when you have to almost constantly defend City’s play got deeper and deeper and the home side found it hard to sustain meaningful possession inside the opposing half. When Wiggins made it 2-0 the signs looked ominous but in true testament to their character City defended as a team brilliantly. Yes we were indebted to some outstanding saves from man of the match Luke Elwes and some fantastic tackling from our new centre defensive pairing, Alex Tomkinson and Reuben Cooke but Magpies did not have it all their own way and we so nearly made it 2-1 when a blistering move in the forward line saw Freddie Paterson go just wide following a scintillating run and cross by Rafe Lochore. Whilst the second half saw Magpies have plenty of shots we had brilliant saves, amazing tackles and a couple of fantastic goal line interceptions (Ethan Rushton’s being particularly memorable). City nearly made it 2-1 when a thunderous short corner shot from Rafe was somehow blocked by a player who admitted he genuinely knew nothing about how he’d stopped it - that’s just the way it goes sometimes! Taylor eventually made it 3-0 but still City didn’t give up despite tired legs and a few unfamiliar positions and they finished the match on a high when Rafe score a scorcher of a goal from the inside left channel. When we stayed calm and played neat one-twos we looked really good - thank you for commitment and never say die attitudes.